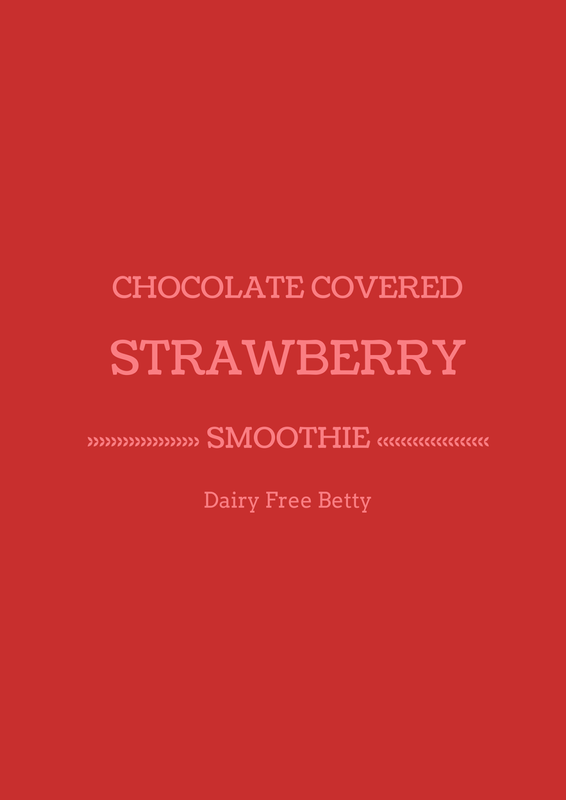 Dairy Free Betty: Chocolate Covered Strawberry Smoothie & a Giveaway! Chocolate Covered Strawberry Smoothie & a Giveaway! Hello all you lovely Dairy Free Betty followers! It has truly been FOREVER! Of course there is always action on my facebook page but as for blogging, I’ve dropped the ball! But here I am!! And lucky for you guys – I have a bunch of giveaways lined up! It’s going to take me a bit to get back into the swing of things & I think my blog deserves a bit of a makeover – so we’ll see what happens! (EDITED - CONTEST NOW CLOSED - please see my facebook page for the winners!) I've been lucky enough to get a huge box of goodies from NuNaturals including Cocoa Syrup which is probably my FAVORITE new treat! I have created a few yummy things since receiving the box of goodies but this is my favorite! It’s a super simple and tasty Chocolate Covered Strawberry Smoothie!! (who doesn't LOVE chocolate covered strawberries?). Side note – I've also started following the Trim Healthy Mama eating plan – which I will save a review for another day but if you follow the plan this would be a Fuel Pull option!! Why the name Chocolate Covered Strawberry smoothie? Because that’s what it reminds me of – juicy strawberries with delicious chocolate! Enjoy! PLUS a bottle of our NEW COCOA SYRUP, and a bottle of the NEW COCOA MINT SYRUP. That’s a retail value of $ 54.00 , PLUS A FREE BONUS PRODUCT ! PLEASE NOTE – They cannot ship to PO BOXES. 3) Comment on this post telling me your favourite recipe using Stevia or why you’d love to win this!! Winners will be announced on my facebook page on Sunday April 5th! If you provided your email address – I will also contact you via email! You will have 36 hours to get in touch to claim your prize! Don’t want to wait but want to make a purchase? Head to https://www.nunaturals.com/ and use the Discount Code BLG0615 and you will receive - 15% DISCOUNT on your ENTIRE ORDER. This discount remains EFFECTIVE UNTIL JUNE 30, 2015 . Please note – I did receive free products to make this post possible – however, my opinion is 100% my own, as always! Oh I like stevia in my hibiscus drink or any prepared drinks in the kitchen by far! Thanks for the giveaway. Your recipe sounds delish! I second the chia pudding! I love to make it with strawberries or peaches and coconut milk. Stevia adds that extra sweetness. Everyone in our house LOVES it! I love to use stevia in all my baking and in my bulletproof coffee! I would like to win this because I've honestly never tried Stevia!! 🙈🙈 I know, epic failure to humanity! Omg that sounds delicious! That syrup calls for another chocolate and fruit combo... Chocolate banana? Chocolate pineapple? I like to use stevia in my iced and hot teas. I need to try it in baking. I'd love to win because NuNaturals just has the best tasting stevia! Other brands are just meh, they can't compare! My favorite think to make using stevia is peppermint mocha pudding. I would really love to try the cocoa syrup and mint cocoa syrup. I'm following you both on Facebook. I would love to win because I am trying to cut back on my sugar intake and the Stevia products seem like the perfect way to satisfy my sweet tooth without doing as much harm to my health. I "Like" you both on Facebook and I've tried and love the Zevia soda made with Stevia!